If you're a solo singer-guitarist who wants to travel light, go straight into the PA and have real-time control over your sound, the VoiceLive 3 could be exactly what you're looking for. Effects are excellent. Well thought-out control layout. Can be used in several ways. Not for everyone - especially if you don't like programming or tap-dancing. It ain't easy being a singing guitar player, but TC-Helicon's new VoiceLive 3 aims to make your switching and effects easy by combining vocal and guitar processors, as well as a looper, into one ingenious package. "There are many ways you can use the unit, thanks to the wealth of connections on its rear panel"
There are many ways you can use the unit, thanks to the wealth of connections on its rear panel, but your basic guitar/ mic setup sends vocals via an XLR output to a PA, and guitar signal from a jack output to your amp - the signals are kept separate, so you won't get vocal harmonies blaring through your guitar rig. The VoiceLive 3 operates using presets - there are 250 factory patches, with plenty more slots to store your own edits, but you can switch effects in and out within a preset. Two footswitches scroll up and down through the presets list, but you also get an extremely useful Step footswitch, which lets you step through different sounds in order - the idea being you can store different sounds within one preset for different song sections. 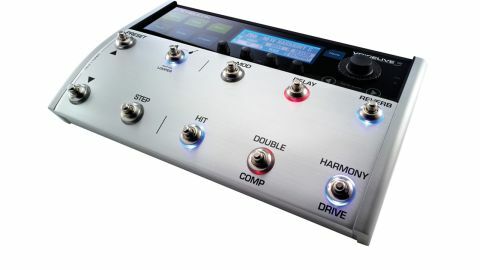 Another set of six footswitches accesses the effects within a preset - five are assigned to single effects (default effects for guitar are modulation, delay, reverb, compressor and drive), while the sixth can be assigned to change several effects at once. Another footswitch toggles the status of the six - so you can instantly change from guitar effects switching to vocal effects switching. Hold it down, and the switches are assigned to the looper, which supports three phrases, plus 45 minutes of looping time and infinite overdubs, allowing plenty of creative possibilities. On the singing front, the 11-block vocal effects path includes, among others, delay, reverb, harmony generation and a vocoder. Plug in a mic and sing through the unit, and you can do everything from adding subtle shading to your voice to completely transforming it - if you want to sound like a robot, here's your chance! The effects are high quality, and the harmonies track your voice really well - assuming you can sing in tune in the first place. Harmonies can be set to a fixed scale but - and here's the good bit - they can also be set to automatically change with your guitar chords. The classy-sounding guitar effects are derived from sister company TC Electronic's TonePrint pedals, and there's a complete pedalboard's worth that can be switched individually or collectively. You also get amp simulation in the signal chain, featuring a range of amps.